Leonard Bernstein lived many lives, so there is ample subject matter for many movies. 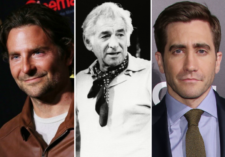 Two are in the works: one starring Bradley Cooper and one starring Jake Gyllenhaal. (Dustin Hoffman would have been a better choice, but he’s too old.) I hope neither picture tries to cover the whole life: that’s a miniseries. I suspect both will center on the 1950s and “West Side Story” — you know, when Lenny was straight.